What new tools are forgotten in YOUR garage? 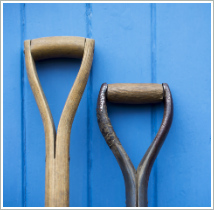 Home » Workplace Improvement » What new tools are forgotten in YOUR garage? When you learn new ideas and gain news tools, you put them to work, right? Yeah, so do I – or so I thought. When spring sprung last year, I went to work planting a new flower garden. It took several sweaty hours to break the ground, clear the weeds, till the soil, and build an edge. The tools I used didn’t help. Most were old and worn out. Even my trusty ten-year-old Garden Weasel fell short when one of its bladed wheels broke apart. Three hours turned into six. The sun climbed higher. The day got hotter. Eight hours in, I decided to save the planting for the next day. That’s when it hit me. As I returned the old tools to the garage, I spotted new tools leaning against the back wall. Yep, I had a full set of brand-new tools. They had been given to me as a gift several months earlier. Why hadn’t I used these new tools in the first place – instead of slogging it out with the old ones? Great question! I had forgotten they were there. I didn’t see them when I got started that morning. I reflexively went to the old ones in their familiar location in the garage. Your garden-variety excuses. The next day, I used the new tools. The work went great, and I finished the job in three hours. The flowers took root and began brightening the yard. But I’m left wondering: What else of value is in my possession but not in use? What other new tools can I put to work? What techniques have I learned recently that I should at least be trying? What newly learned ideas call for deeper exploration and discussion with colleagues? We all have new and better tools, techniques, and ideas. Let’s make sure they don’t get forgotten in the back of our garage.